We met Finn at the USJDGC and was able to catch up with him to get some questions answered. We always enjoy getting to know these super star disc golfers a little bit better and we hope you do too! KDG: Where are you from? KDG: How old are you? KDG: How old were you when you were introduced to disc golf? KDG: Why do you like disc golf? KDG: What’s your home course? FINN:Smuggler’s Notch and there is also a nine hole course in Charlotte that’s even closer to my house. So both, I guess. KDG: Is that course wooded or open fields? KDG: Do you prefer fields or woods? KDG: When did you start playing disc golf? KDG: Who taught you to play? KDG: How do you learn to get better? KDG: How often do you practice? KDG: What’s your favorite disc/s? KDG: How often do you get out to play a round of disc golf? FINN: Maybe a couple times a week in the summer. Maybe more. KDG: Do you play the junior tees/short tees if they have them or the normal tee locations? KDG: Do you like playing! in tournaments? Why? KDG: How far do you think you can throw a disc? FINN: I don’t know, maybe 250 feet? or 300 feet maybe if it’s downhill. KDG: Straddle or Straight style putting? KDG: Favorite disc golf manufacturer? Why? FINN: Innova. They make lighter weight discs so it’s easier for kids to throw them. KDG: Favorite professional disc golfer? Why? KDG: What else do you like to do when you’re not disc golfing? FINN: Baseball, and looking at wildlife, and soccer, and kayaking, and playing around in streams. KDG: Are you a member of any disc golf clubs or organizations? FINN: PDGA and soon I want to join Kids Disc Golf! KDG: Do you have any sponsorships? FINN: Not exactly, well, Innova said they wanted to sponsor me starting next year, I think. KDG: Do you hope to be professional one day and play in the pro events? KDG: Do you prefer playing with other Junior players or adults? KDG: What would you tell someone who has never heard of disc golf before? Why should they play? FINN: It’s fun and it’s not that fast! You can kind of rest and play it without getting tired. KDG: What’s one course you’ve heard of or seen on YouTube that you would love to play if you had the chance? KDG: Do you have any aces? FINN: Yes, one, at Smuggler’s Notch hole 1. Also, I have mini baskets and I have a few aces with those! KDG: Do you side arm more or backhand more? FINN: Come play in tournaments! Finn Etter is the current U.S. Junior Champion in the PDGA Junior 8 division. Check out what he has to say! Kids Disc Golf features junior disc golfers as a way of putting the spotlight on the big things they are doing. Featured players! Kids Disc Golf is placing the spotlight on the Ahrens Brothers! Both Tyler and Carter are demonstrating a deep love for the game. Not only that, their skills are leaving people very impressed! Kolby Sanchez won the title of World Champion at this years PDGA World Championships. He is the Kids Disc Golf featured player for the month of August! Seven year old Wyatt Mahoney became a disc golf sensation after hitting a perfect 210 foot ace at a recent Kids Disc Golf tournament! Lucy Burks is the month of May featured player at Kids Disc Golf! She couldn't wait to answer our questions and you're going to enjoy reading them! Get to know Lucy! Judah Berman is the featured player of the month at Kids Disc Golf. What a special junior disc golfer he is! Six year old Landon Brooks is no ordinary six year old. At age 5 he became a World Champion after competing at PDGA AM Worlds in the MJ6 division. Kids Disc Golf tells the story of how it started and where the idea for the United States Junior Disc Golf Championships came from! Upper Park Designs joins Kids Disc Golf and the first ever United States Junior Disc Golf Championships (USJDGC) as a Premier Level Partner. Dyamic Disc joins Kids Disc Golf and the first ever United States Junior Disc Golf Championships (USJDGC) as a Premier Level Partner. Innova Champion Discs joins Kids Disc Golf and the first ever United States Junior Disc Golf Championships (USJDGC) as a Premier Level Partner. The United States Junior Disc Golf Championships (USJDGC) is proud to welcome four different premier level partners. We are going to highlight each premier partner in no particular order as a way of saying thanks! Kids Disc Golf, in partnership with the Disc Golf Pro Tour, will be providing a special opportunity for junior aged players to meet select touring professionals at each stop. Dynamic Discs, Innova Champion Discs, Discraft, and Upper Park Designs all bring a unique and professional offering to the world of disc golf. 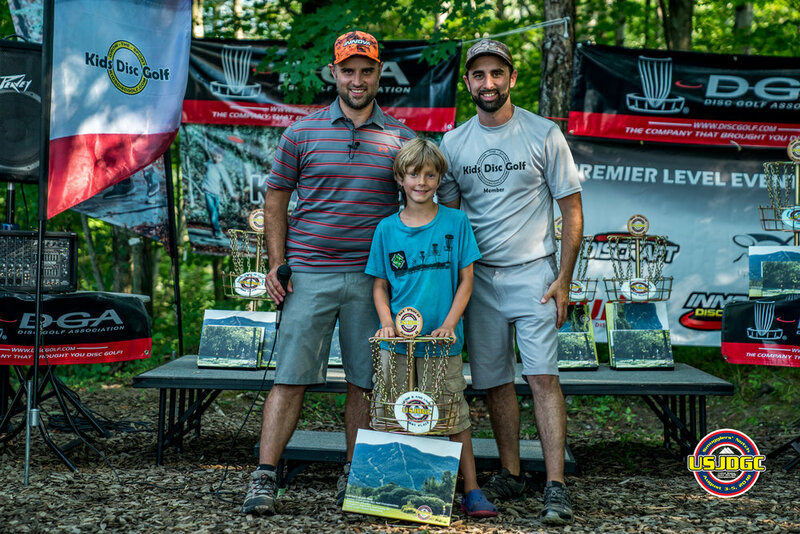 Kids Disc Golf is proud to partner with each of them to present a world class junior disc golf event; the United States Junior Disc Golf Championships at Smugglers' Notch - America's Family Resort! We found out what Parker is up to now! We couldn't wait to share the video we discovered on YouTube back in November of 2016 and now we have some back story! DUDE Clothing has come on in a big way to support Kids Disc Golf! Dynamic Discs partners with Kids Disc Golf by taking on the role of title sponsor for three series events! Innova Champion Discs supports Kids Disc Golf by taking on the roll of title sponsor at five KDG state series events! So you play disc golf and want your young child to have the best opportunity to succeed at the sport we all love? Check out these six important considerations when introducing disc golf to any young child. Kids Disc Golf announces Maine as the second state to play host to a state championship series designed specifically for youth! The New England Flying disc Association steps up in a big way to support the growth of disc golf by partnering with Kids Disc Golf. Let us know what we left out! There are so many good reason to get your kids into Disc Golf! Innova Invites Six Year Old Hunter Grayum on to Junior Team! Imagine Hunters surprise when the phone call was Paul McBeth and it was for him?! Massachusetts Junior Disc Golf Championship Series Announcement Coming Soon! It's almost here! We'll announce the details for a series of junior events coming to Massachusetts.